Officially the longest country in the world (due to Antarctica being included in its borders), Chile has many similarities with its neighbour, Argentina…and also many differences. Taking in such infamous areas as the Torres del Paine National Park, the Atacama Desert, Easter Island and the exciting city of Santiago, Chile can be a destination in itself or can complement any of its neighbours. On the whole a visit to Chile is seen as territory for those that are looking to be a little more hands on and get out amongst the nature. Similar in feel to Argentinean Patagonia, this is a region of harsh winds and stark mountain backdrops. By far the most well known area is the mighty peaks of the Torres del Paine National park that jut out from the surrounding plains to the north of the main town, Punta Arenas. This national park is the perfect place to head to if you are a keen walker…or just keen on nature. Elsewhere in the region, there are a series of small islands and inlets that reach out into the Pacific that offer a whole host of interesting activities and locations in which to explore. This region can easily be accessed either by boat from Ushuaia on a 3 night cruise, or, via El Calafate on the Argentine side of the border. 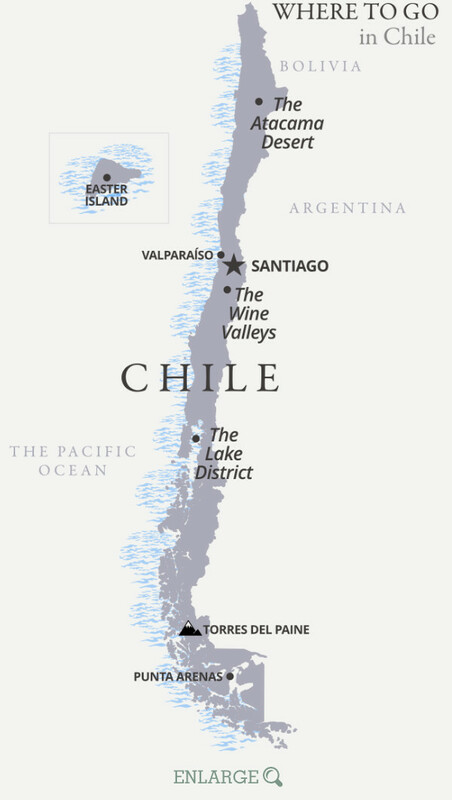 Similar to the Argentinean Lake District, the Chilean side offers, arguably a little more seclusion and (they would argue!) a little more beauty with the sleeping Osomo Volcano at the heart of the park. Like Argentina, this is an area of outstanding natural beauty with lakes and plunging hills offering stunning views at every turn. Again, an area that many walkers favour for the pine covered forests and scenic walking on offer. Simple to combine with Argentina with a fantastic boat trip across Todos Los Santos Lake and overland to Bariloche being the preferred route. Born out of the trade routes from the east to west and west to east round the Cape, Valparaiso has always had an interesting history. The first thing that strikes you as you enter this foggy town is that it is a wonderful array of colours, shapes and sizes. Much of what the old town is constructed from is the scrap metal and iron that was carried around the Cape as ballast and then dropped here. What it makes for is a marvelously rolling and confused mesh of constructions and houses. To this day, it is still possible to use one of the many trams that still transport up and down the steep inclines of the town. An easy day trip out of Santiago, Valparaiso can be visited for a night or two or for just a few hours. 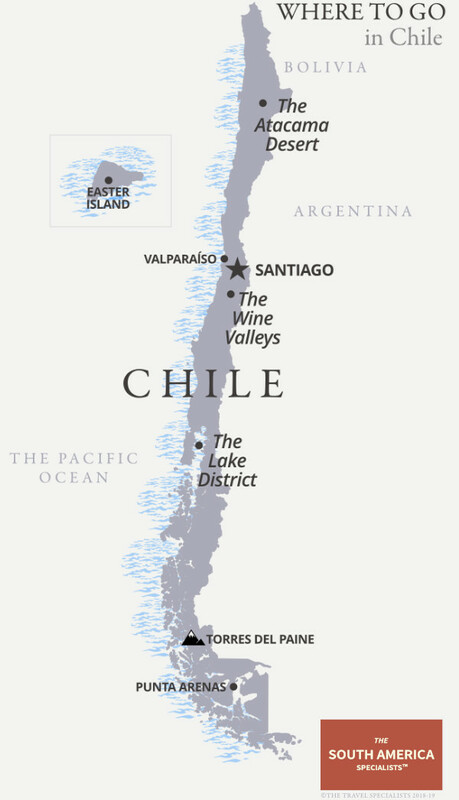 The area surrounding Santiago to the west and south is the wine-growing region of Chile and a superb place to spend a few nights. The wine that is most famous out of Chile is the Carmenere, which these days, can be added to a bath for its mineral qualities. If you prefer to drink the stuff there are plenty of opportunities to try not just Carmenere but Malbec, Cabernet Sauvignon and outstanding Sauvignon Blanc, amongst many others. Again, located just outside of the capital, this is a fantastic area to spend a few nights. The Chilean capital is well worth a visit and an inclusion on any itinerary. Much smaller than Buenos Aires it has the feel of a town that has expanded, rather than a city that is being confined and, as such, it has a much simpler and more welcoming feel to it. As with any Chilean population, the population of Santiago is hugely multicultural and refined and so there are plenty of good and interesting restaurants and bars to visit while here. The flying time is approximately 2 hours door to door from Buenos Aires. Set at approximately 2,400m, the Atacama desert is famed for being the driest place on earth and receives less than a millimetre of rain a year! The reason for this phenomenon is that it sits between two mountain ranges, the Andes and the Chilean Coast Range, which trap any moisture and stop it from entering the region. For most who come here, it is a chance to witness a desolate wilderness and take in the Chilean view of the Andes range as it winds its way south. While it may look barren, however, there is an absolute feast of activities that can be done while here....some requiring effort...some requiring none at all! Getting here from Argentina is a little harder than for other areas of the country and either involves a couple of flights from Buenos Aires to Santiago and up to Calama, or it is also possible to drive right over the top of the Andes from Salta.